The first book of poetry that 2014 MacArthur Fellowship prize-winner Terrance Hayes ever bought was the 1990 edition of The Best American Poetry, edited by Jorie Graham. Hayes was then an undergraduate at a small South Carolina college. He has since published four highly honored books of poetry, is a professor of poetry at the University of Pittsburgh, has appeared multiple times in the series, and is one of today’s most decorated poets. His selections for 2014 edition of The Best American Poetry reflect the restlessness of his own barefaced poems, and together the poems in this volume capture with singular artistry the diversity of American culture. In this edition readers will find such known favorites as John Ashbery, Anne Carson, Frederick Seidel, and Mary Ruefle alongside the newer voices of Camille Dungy, Amaud Jamaul Johnson, Valzhyna Mort, and Sandra Simonds. For over twenty-five years the Best American Poetry series has stood as the foremost compendium of contemporary poetry, an annual record of exceptional works published over the past year and provocative testimony to the art form’s significance today. 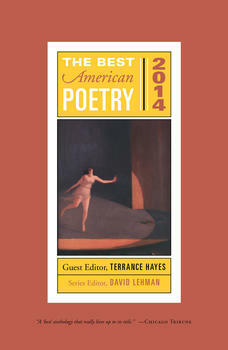 Always eagerly anticipated, the 2014 volume begins with David Lehman's “state-of-the-art” foreword followed by a beguiling introduction from Terrance Hayes on his picks for the best American poems of the past year. Illuminating comments by the contributors conclude the volume.